Michele Coe (of Reach for Recovery) informed me that they had no bags that they give out to the patients that have had breast cancer surgery. 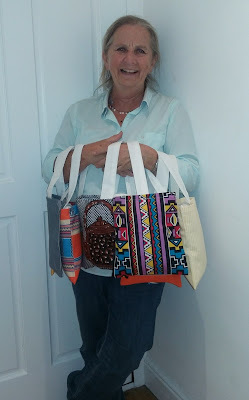 As Elaine Wegelin, my Mom, had been through the surgery side of breast cancer almost exactly a year ago, I asked if she could think of some ways to get the bags made. She jumped right in and said that she definitely wanted to help. 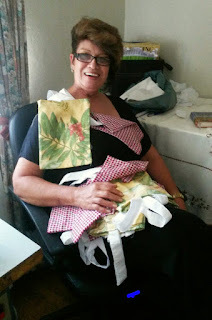 As she lives in Wellington, she approached some of her friends and also the Wellington Presbyterian Church who are always interested in community projects. She told them about Reach for Recovery and explained how useful the little bag and cushion is post-operatively. There was a lady in the church desperately looking for work. It was arranged that people could donate money towards the project. A certain amount of money would fund 1 bag. 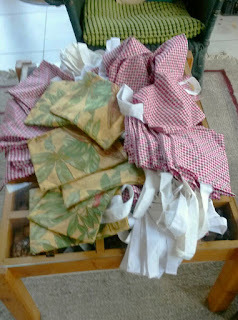 In total, they raised enough money to make 120 bags and cushions! Reach for Recovery supplied the material and stuffing. 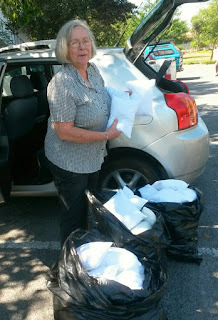 About 2 weeks later, Elaine arrived with the 120 bags and cushions. She is hoping to continue the project as she could not believe when she went onto Reach for Recovery's website, that they need about 40 bags per month for the amount of patients that they see on a monthly basis. She is hoping to find more people to volunteer their time and skills to produce the bags and cushions on an ongoing basis to help these ladies in a small way after their surgery. Thank you Reach for Recovery for the support that you give our patients and a big thank you to each and every person involved with the cushion project! 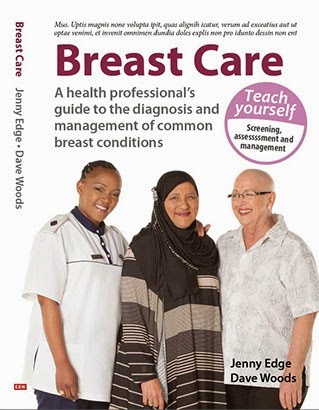 To my mom Stella and all the other ladies that assists - well done!